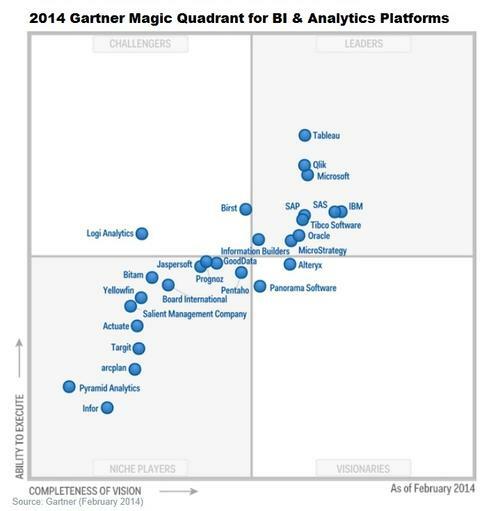 Tableau and QlikTech move up. See who moves down in Gartner's ranking of business intelligence vendors. The more things change, the more they stay the same. That adage could apply to Gartner's Magic Quadrant for Business Intelligence and Analytics Platforms for 2014, released last week, as the same vendors show up in the prized Leaders quadrant. In Gartner's defense, BI and analytics suites don't tend to change dramatically in one year, so incremental shifts are to be expected. What's more, within each quadrant there are notable shifts in vendor positioning. First, all vendors moved to the left on the horizontal Completeness of Vision axis. That's because Gartner has raised its expectations, something it must do each year so vendors never get to the top-right corner and start resting on their laurels. 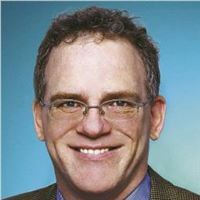 The broad shift to the left is tied to the years-long ascendance of data-discovery platforms from the likes of Tableau Software, QlikTech, and Tibco Spotfire. Data discovery is now driving the majority of new software license revenue, but these platforms tend to lack "the necessary features in relation to governance, administration, and scalability," Gartner reports. Meanwhile, incumbents like IBM, SAP, Oracle, and MicroStrategy that tend to do well on governance, administration, and scalability have had "limited success in delivering 'good enough' data discovery capabilities," Gartner writes. In other words, practitioners want and need the ease and speed of data-discovery platforms, but they shouldn't have to give up admin control and the assurance of data-modeling and data-quality consistency across high-scale deployments. "The race is on to fill the gap in governed data discovery," Gartner writes. "Next year, Completeness of Vision positions will in part be determined by which vendors achieve success in addressing this critical market requirement." As for the vendors that bucked the broad trends, Tableau Software and QlikTech both moved to the right on the Completeness of Vision axis, but Tableau Software also moved up significantly to become the top-ranked vendor on the Ability to Execute axis. "Tableau's strong survey results for customer satisfaction, coupled with its market momentum, are behind its dominant Ability to Execute position," Gartner reports. "Surveyed customers identified ease of use for end users and developers, and functionality, as their main reasons for choosing Tableau. In fact, 73% selected Tableau's product for its ease of use for end users, which places it among the top two vendors in the survey." Oracle and MicroStrategy sank significantly on the Ability to Execute axis, though they remain in the Leaders quadrant. Oracle's decline was tied to customer survey results that showed that "recent Oracle BI releases received scores for customer experience, including support and product quality, that were among the lowest," Gartner states. At MicroStrategy, "customers identified ease of use for both developers and business users as an ongoing concern. They also reported issues with software and support quality. MicroStrategy received the second-lowest result of any vendor in the survey for both of these criteria." 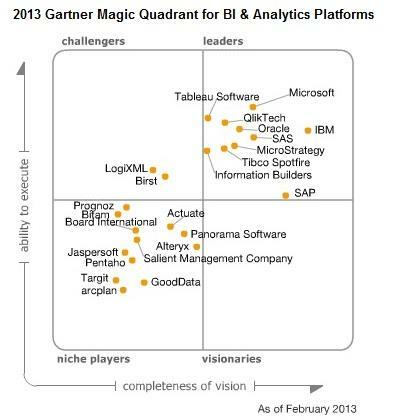 As for Alteryx and Panorama, the two vendors that jumped into the Visionaries quadrant, Gartner lauded Alteryx for "the highest capability and use scores for ad hoc reporting and querying, geospatial and location intelligence, the second-highest for support for big data sources, and the third-highest for business user data mashups and modeling." Panorama was praised for its "high marks for ease of use, breadth of use, and enabling users to conduct complex types of analysis. Panorama also received high marks on critical satisfaction metrics for product functionality, support and product quality." Birst and GoodData also rose significantly in Gartner's latest report, with their gains tied to growing acceptance of cloud-delivered BI and analytics capabilities. If you want greater career and compensation potential, I would move into analytics. That may require more schooling and experience, but there's more career potential, including moves into big data analysis and data science. 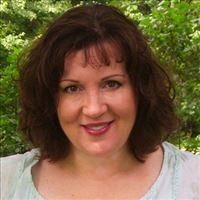 Hope you all are doing good, I am in Business Intelligence and have around 3 years of experience in Micro strategy BI tool, although in BI market is hot but i want myself in Analytics profile, so i searched for BA programs in US and in India, my question is should if go for Analytics or should i continue with BI profile and after more exp in my profile i should go for it , bit confused now....is it a right time to go for it or to wait and continue in BI. In which profile i can get a broad future(money wise off course). Moreover pursuing MS in analytics from an good US university will a be a good move or doing any small training based programme from India( which include 2 months tool training) will do it better, as I don't have any Analytics Experience so I will be counted as fresher in analytics if I got any job in analytics now. Will appreciate your concern on this. Re: Analytics versus advanced analytics? Superb graphics and dynamic presentation. I wish some of my BO reports looked this good and were so reactive. Once we upgrade to BI4.1 later this year, I fully anticipate bringing the estate up to this standard. Nice article... I think you will find that your observations are neatly mirrored in our visualization. For a great animated visualization of how BI Vendors have shifted position over the trailing 5 year period, visit http://hub.am/1hYxrKB where we have used Power View (MSFT Leader) to create a time-phased analysis. Good stuff. I think they've got everybody who is anybody here (with a North American bias), but by including Infor, an enterprise applications vendor, Gartner kind of opened a door to others in that category. Why not include Epicor or Workday, both of which have embedded business intelligence capabilities? This is a fine line to cross, but more coverage is better. Doug, Pentaho Corp made one of the largest positive movements on the MQ this year -- if not the best forward momentum for combined execution and completeness of vision. For customers who want to address both business users' need to easily access and analyze data and IT's need for governance, security and scalability, Pentaho should be considered. Pentaho's business analytics platform investments are focused on addressing the changing dynamics and demands of both disruptive big data and embedded analytics environments. Doug, was any company left out that you think should have been included? No mention of the newcomers to the quadrant? Been reading your posts for some time now - never commenting until now. Maybe this was by design - but you did not mention the 3 newcomers to the MQ - Pyramid being one of them? I believe there are something like 300 other BI tools that didn't even make the minimum requirements to be in the MQ - so we were thrilled to make the Niche Player quadrant. Will continue to visit the posts - thanks! Gartner published a seperate quadrant this year for "Advanced Analytics Platforms," which covers "prescriptive and predictive modeling, forecasting, simulation and optimization." The BI report covered above, in contrast, addresses business intelligence reporting, dashboarding and discovery as well as analysis, forecasting, and optimization. In other words, not-so-advanced analytics. Basics like simple trend analysis that projects forward a bit based on historical data rather than doing complex modeling of factors such as seasonality, pricing variables and so on. We plan to cover that Advanced Analytics quadrant later this week.